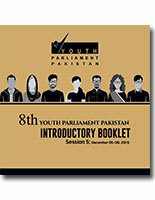 The 8th Youth Parliament Pakistan trained 240 young Pakistanis, 60 each in 4 sessions in political and democratic affairs. The fifth and final session of this Youth Parliament consists of only the top 15 MYPs from each of the 4 sessions this year, thus representing the crème de la crème of the 8th batch and includes some exceptionally bright young women and men. These members, through their hard work and dedication in their respective sessions, are able to make it to the 5th session. They passed through a comprehensive and transparent evaluation process. The Members also worked within their respective Youth Standing Committees and presented their set of recommendations to panel of experts.